It is high time we discuss a deceptive and unreliable program that pretends to be useful. Its name is SkyEmoji and it might seem like a fun program to use, but we are of the opinion that you should remove it as soon as the opportunity arises, because it is an adware application, which is bound to subject you to unreliable ads. The advertisements are somewhat dangerous, because they are provided by third parties. Furthermore, they are quite intrusive and will definitely hinder your browsing with their constant nagging. That is why we suggest that you delete this app. SkyEmoji has been developed by Montiera Ltd. This company is known for creating adware applications. It has been set up in 2009, so it has a lot of experience in creating deceptive products. It provides web traffic monetization services. The company claims to be the next best thing since sliced bread on its website Montiera.com. All this promotional nonsense is set to lure in clients who are ready to make as much money as possible by bombarding your computer’s screen with unasked for ads. Adware developers almost always use software bundles to disseminate their “products,” and SkyEmoji also follows this trend. The way this thing works is fairly simple to understand. Adware developers approach owners of freeware distributing websites and cut a deal with them. The developers agree to give a slice of their profits and the website owners bundle programs, such as SkyEmoji, with legitimate programs and put them up for download. We call this tactic deceptive, because the installer is purposely made to mislead the user and give as little information about additional software as possible. However, SkyEmoji can also be downloaded from a website, called Skyemoji.com, which features a standalone installer. SkyEmoji should be compatible with the latest versions of Skype, but we just do not know if the application will be constantly updated or not. In any case, this application features a dedicated window that contains a selection of secret emojis that are normally not shown on Skype. You can type the secret emojis manually, but that is time consuming and annoying in the long run. So this application seems like a good idea. However, the fact that is displays suspicious advertisements similar to those you would find on piracy websites is a bit worrying. The ads might promote illicit content and malware downloads, because we have seen fake system error messages that may trick the user into thinking that that is the real deal. And above all the ads are plain annoying and you can really do without them. Therefore, we recommend that you remove SkyEmoji and save yourself the trouble of dealing with additional malicious applications. 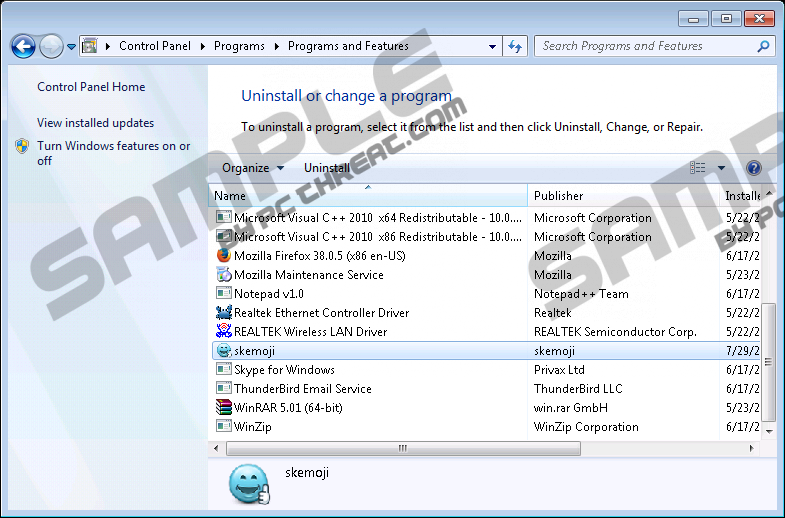 The removal guide provided below will help you uninstall this program and restore your browser’s homepage. We also recommend that you scan your computer with a dedicated anti-malware tool that will neutralize all malware that may be present on your computer. Find SkyEmoji, right-click on it and click Uninstall. Find SkyEmoji and right-click on it. Press Alt+F and find the On Startup list. Enter a new homepage address and click OK.
Quick & tested solution for SkyEmoji removal.